Pooja Kumari from Durgapur, B.E. - B.Tech Graduate. 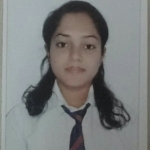 Pooja Kumari is Developer and currently have no work experience. C C++ JAVA CORE JAVA . .NET ( VB.NET MICRISOFT POWER POIN.. MICROSOFT WORD & MIC..
Pooja Kumari is working in IT Software industry.